I think we should review B12 in general, so you’ll know exactly why getting the best type of vitamin B12 is so crucial. First, let’s differentiate between the two supplemental forms of vitamin B12 which are available. There is a vast world of difference between the two. WHAT form of Vitamin B12 is healthy? Cyanocobalamin is the most commonly supplemented form of vitamin B12. Why? Because it is cheap, that’s why—sigh. This form of vitamin B12 does not actually occur in plants or animal tissues. In other words, outside of the chemically synthesized cyanocobalamin in most vitamin B12 supplements you simply would not be able to find a naturally occurring source. As the name implies, cyanocobalamin does actually contain a cyanide molecule. Most people are familiar with cyanide as a poisonous substance. Although the amount of cyanide in a normal B12 supplement is small and viewed as insignificant, your body still needs to eliminate this compound. Removal occurs through your detoxification systems with substances like glutathione being crucial for the elimination of the cyanide. Side note: Your ability to make your own glutathione goes down 1% annually after age 20 so by 50, you’re “done.” In other words, by age 50, you need supplemental glutathione in spray or injectable form. The majority of oral glutathione is not absorbed so read your supplement labels. Compared with cyanocobalamin, methylcobalamin is significantly better absorbed and retained in higher amounts within your tissues. In general, methylcobalamin (which I’ll sometimes call MCB) is used primarily in your liver, brain, and nervous system. I’ll get into lots of specifics about MCB and hope to convince you to purchase the best type of vitamin B12—MCB—for real health benefits. Just keep in the back of your mind rule one: Do not buy cyanocobalamin! Now, when I discuss vitamin B12, please assume that I mean MCB. Also, with MCB, you don’t have to eliminate a known toxin plus it’s absorbed and utilized by your body much much better than the “other form.” OK? Vitamin B12 deficiency is thought to be one of the leading nutrient deficiencies in the world. A 2004 study shows that it’s a major health concern in many parts of the world, including the U.S, India, Mexico, Central and South America, and certain areas in Africa. In addition, vitamin B12 is an essential vitamin that’s crucial for addressing adrenal fatigue as well as being crucial for multiple metabolic functions including enzyme production, DNA synthesis, and hormonal balance. It is also needed for healthy nervous and cardiovascular systems. We’ll get deeper into these processes in a bit. Who is most at risk for having a vitamin B12 deficiency? Older adults who tend to have impaired digestion are one of the most susceptible populations. This is because older people tend to produce less stomach acid that is necessary to digest vitamin B12 properly. Since animal foods are usually the best sources of vitamin B12, vegans also will have deficiencies. Other groups that are at a higher risk of having a vitamin B12 deficiency include alcoholics, smokers (nicotine blocks B12 absorption), and anyone with a digestive disorder like Celiac disease or Crohn’s disease. Further, a surprising group, those who are taking proton pump inhibitors such as Prilosec and Nexium tend to have a lack of stomach acid which is needed for oral B12 absorption. These drugs are dangerous, and one should replace them with natural methods anyway. About 2% of people do not absorb B12 well, and this doesn’t include the above groups or those with “pernicious anemia,” a form of vitamin B12 deficiency associated with the absence of what is called “intrinsic factor.” Now I’ll go into some other risks which are largely unknown. You might be very surprised. Metformin, the commonly used blood sugar lowering medication, has been demonstrated to be a risk factor for B12 deficiency, a fact that few patients are informed of before complying with treatment. The incredibly horrifying synergy of gluten-containing and genetically modified processed foods may have an impact on everyone’s guts, not just those people with biopsy-confirmed Celiac disease. One of those “things” is a decrease in the body’s ability to absorb even the best type of vitamin B12, let alone “the other one.” Let’s get back to gluten sensitivity for a moment. Take gluten seriously. We don’t know everything but are growing increasingly aware of the dangers of eating gluten. The gluten immune response can include symptoms that exclude the GI-tract. These symptoms include things like joint pain, rashes, multiple food sensitivities and even “off-the-wall” things like having a peripheral neuropathy. In certain individuals, the immune system responds to gluten in these grains by passing them into the blood stream through the walls of the GI tract. Message: If you are having weird non-diagnosed symptoms it’s not in your head, ask for celiac blood tests! If they are negative, you still can have a gluten intolerance so try an elimination diet and include supplemental MCB. Although you may be aware of this, it’s worth a mention because if there is doubt, you’ll get checked. Without intrinsic factor, the body absorbs very little B12. People with intrinsic factor defects who do not get treatment will develop a severe anemia called pernicious anemia. The first sign on a CBC (blood count) can be an elevated “MCV” or red cell size. PA requires medical treatment. Most doctors will prescribe B12 injections. However, there is ample evidence that sublingual forms absorb nicely and bypass the stomach acid we wish to avoid. Vitamin B12 is one of the vitamins that give you energy. This is because it’s necessary to convert carbohydrates into glucose in the body. Glucose from carbohydrate foods is used as a form of energy. In fact, this is the reason why people with vitamin B12 deficiencies often experience fatigue. Vitamin B12 is also essential for brain chemical signaling that helps your muscles contract properly. Note that inadequate supplies of glutathione, the most important intracellular antioxidant, leaves your B12 more vulnerable to toxins. Therefore, keeping good glutathione levels up are crucial for your B12 levels too. A highly researched but little-known function of B12 supplementation is its role in reducing disorders like depression and anxiety. Vitamin B12, along with folate, is needed as a major determinant of one-carbon metabolism, which produces the compound called SAMe (S-adenosyl methionine). SAMe is crucial for making neurotransmitters which help us deal with stress and keep our mood happy. In addition, there is evidence that depression is related to B12 deficiency a lot more often than we all (I mean other doctors) think. Some evidence suggests mood-related B12 deficiency can be confined to the brain. This means serum levels will be normal. In such cases, large doses of methylcobalamin (not the “cheap one”) might be necessary to replete B12 stores in the brain. This dose would be 5000 mcg per day for 2-4 weeks. 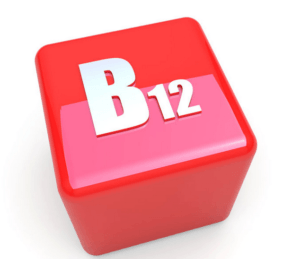 How does B12 impact the Brain’s Health? B12 supports the production of myelin (which allows nerve impulses to conduct). Therefore, when you are B12-deficient, it can mimic or cause symptoms/disorders such as dementia, multiple sclerosis, impaired sensation, and gait. Vitamin B12 is necessary for concentration and cognitive processes. This means that a vitamin B12 deficiency can result in difficulty focusing and an increased risk for attention disorders. A deficiency can cause memory and concentration deficits. It is one of the best brain supplements as this powerful brain vitamin amps up memory and mental acuity. If you are looking to boost cognition, you’ll want B12 on board before adding your brain boosting supplements. Vitamin B12 benefits cardiovascular health in several ways. Vitamin B12 helps to reduce elevated homocysteine levels; a major risk factor for heart disease. Homocysteine is an amino acid which can be measured on blood tests. Its levels in the blood are influenced by blood levels of B-complex vitamins, including vitamin B12. Methionine is an essential amino acid the body obtains from protein in the diet. Some methionine turns into homocysteine. The body turns much of this homocysteine back into methionine with the help of vitamin B12. If someone is B12-deficient, homocysteine levels will increase because this reaction cannot take place. Keeping homocysteine at levels associated with lower rates of disease requires both adequate B12 and folate levels. Low vitamin B6 status can also cause elevated homocysteine in some people. Homocysteine damages vascular walls by decreasing nitric oxide bio-availability, increasing intracellular oxidative stress, and by triggering multiple pro-plaque-forming cascades. What does the research say about Vitamin B12 and heart disease? A 2008 article published in the Journal of the American College of Nutrition looked at the effects of a combination of folate and vitamins B6 and B12 upon the risk for coronary heart disease amongst a large population (more than 40,000) of middle-aged adults. The study concluded that “coronary artery disease and myocardial infarction were inversely associated with dietary intake of folate, vitamin B6, and vitamin B12.” Subjects who took less than the recommended amounts of all three supplements, or who only took vitamin B6, had “twice the amount of excess risk of total coronary heart disease” than those who did not take them. A 2004 article in the journal Stroke looked at the relationship between risk of stroke and folate, vitamin B6, and vitamin B12 intake for a group of more than 43,000 men between the ages of 40 and 75. The researchers found, after factoring for diet and lifestyle, the risk for ischemic stroke significantly decreased with supplement intake. There was less of a cardiac emphasis in this article. However, numerous studies have shown risk factors for stroke and heart disease to be the same. Due to its role in helping with digestive enzyme production, vitamin B12 is needed to assist with the breakdown of foods within the stomach. One of the ways that vitamin B12 benefits digestion involves the microbiome I have discussed in numerous articles such as this one. Vitamin B12 helps to promote the environment for healthy bacteria to set up shop within the gut environment. The elimination of harmful bacteria in the digestive tract—and simultaneously the presence of beneficial bacteria—is what helps prevent digestive disorders like irritable bowel disorder, leaky gut and so on. Vitamin B12 supplementation is now being studied as a way to help lower the risk of certain kinds of cancers, especially when taken with folate. Some preliminary research shows vitamin B12 benefits the immune system enough to help prevent cancer potentially. Those types studied thus far: colon, cervical and prostate cancers. Everyone thinks “folate” when they think of their needs during pregnancy, but it turns out, that is certainly not the only important vitamin. Folic acid intake in the weeks before and after conception shows to decrease the number of neural tube defects (NTD), such as spina bifida. While the focus has been primarily on folate deficiency, there has been increasing interest in B12’s role in fetal development. Molloy et al. (2009, Ireland) conducted three separate case-control studies and found that women with a serum B12 level of less than 300 pg/ml were significantly more likely to have a baby born with neural tube defects. Taking vitamin B12 might be important for bone mineral density. Two studies have linked low B12 status in vegetarians to a higher incidence of osteoporosis. Effective osteoporosis treatment involves considerably more than B12 supplementation, but it’s an excellent addition to a regimen. The most well-studied use of methylcobalamin has to do with sleep, believe it or not! Researchers believe that methylcobalamin is necessary for the synthesis of melatonin. Methylcobalamin can likely modulate melatonin secretion, enhance light-sensitivity, and normalize circadian rhythm (your 24-hour clock). Because of this, individuals under 35 who supplement with methylcobalamin often have improved quality of sleep, often will require slightly less sleep, and will not uncommonly report they feel more refreshed upon awakening. The best natural sleeping aid for those under 35 usually turns out to be plain old vitamin B12! Methylcobalamin is particularly effective when your 24-hour clock is not running smoothly. Maybe, you’re a frequent traveler. Perhaps, you have a need for excessive sleep, or a tendency to have altered sleep-wake patterns. As examples, you might require 10-12 hours of sleep, or you might not feel tired until 2-3 am and you might wake up at noon, or you might find that you awaken a bit later every day and go to bed a bit later every night. Under all of these circumstances, the combination of methylcobalamin (about 3000-5000 mcg daily) and exposure to bright light in the morning can help reestablish your 24-hour clock. Remember, these are recommendations for the under-36 crowd. If you are older than 36, you will have diminished melatonin levels, and no amount of B12 will restore that; you need melatonin to help these issues. Because of methylcobalamin’s impact on everyone’s 24-hour clock and the cycles that feed off of this, it is also an important vitamin to regulate your 24-hour release of the stress hormone cortisol. Is MCB a form of natural stress relief? For some, indeed it is. Because of methylcobalamin’s importance in nervous system health, it is also an important nutrient for vision. In fact, continued visual work (like work on a computer) often leads to a reduction in something called “visual accommodation.” Methylcobalamin can significantly improve visual accommodation, while cyanocobalamin appears to be completely ineffective. (I thought I’d just throw in a little reminder about what we know is the best type of vitamin B12). You can take Vitamin B12 in tablet form, in drops under on the tongue or via an oral spray. Another option is to take it as an injection. People over 55 do better with drops, chewable tablets and oral spray forms of vitamin B12 because they have trouble absorbing the vitamin from the stomach. Remember if absorption might be an issue, go with forms other than a tablet or capsule. If you are battling depression, are anemic, have a high homocysteine or just plain want more energy (or you are on a PPI drug) you’ll get a nice energy burst with a chewable tablet or a spray. Because vitamin B12 is a water-soluble vitamin, the body is able to flush out (through our urine) any excess that it doesn’t need. As a result, pure vitamin B12 is considered safe and non-toxic. You can’t “OD” on B12. Yes Cathy, they sure do and I was taking cr-p also! Maddenning that HF stores can sell anything they want-no GMP sticker, no non-GMO sticker and now I find out my B12 is poison. UGH! Amazing-me too-I guess most manufacturers do cheap out! Good to know this stuff. Wow, I was taking -you guessed it- cyanocobalamin-for sure switching up!